His Imperial Highness Prince Regent Nguyen-phuc Buu Chanh of Vietnam, Imperial Prince of Kien Hoa, Descendant of His Imperial Highness Prince Nguyen Phuc Mien Dieu, Duke of Kien Hoa, and the 71st Prince of His Imperial Majesty Emperor Minh Mang, is the universally recognized as Grand Master of THE IMPERIAL ORDER OF THE DRAGON OF ANNAM, having personally re-established the Order with all due religious ceremony at 0900hrs (US Central Standard Time), on the 30th October 2002, (which is September 25, of the Year of the Horse). His Imperial Highness Prince Regent Nguyen Phuoc Buu Chanh holds the same Imperial Family rank as the Emperor Khai Dinh (the late father of Emperor Bao Dai). Initially upon the re-establishment of The Imperial Order of the Dragon of Annam, His Imperial Highness held the appointment of provisional Grand Master, however in 2004, at a High and very beautiful ancient religious ceremony, His Imperial Highness was bestowed with the most treasured and ancient, Dragon Ring of the Imperial Nguyen Family, and from that date onward assumed the Imperial Rank of Regent, and the appointment of Grand Master of the Imperial Order of the Dragon of Annam. His Imperial Highness was born on the 12th February 1942, in the Imperial City of Hue, the illustrious and ancient Capital of Emperors and Empire. Prince Regent Nguyen Phuoc Buu Chanh, was born under the Imperial Family of the Prince of Kien Hoa (The Duke of Kien Hoa), who was the 71st son of the Emperor Minh Mang. His Imperial Highness Prince Buu Chanh, is a true Vietnamese patriot, working tirelessly for the restoration of dignity, democracy and a constitutional monarchy in Vietnam as well as Indochina as a whole. His Imperial Highness is currently: General Secretary of the Vietnamese Imperial Family Overseas Central Council, President of the United International Supreme Council for the Freedom of Vietnam (and South East Asia), President of the Vietnamese Constitutional Monarchist League, President of the Southeast Asia Imperial & Royal League, Vice-Chairman of The British Committee for Free Vietnam, Laos, Cambodia & Burma. His Imperial Highness Prince Regent Nguyen-phuc Buu Chanh attended the National High School at Hue, Viet-Nam before earning a B.A. degree in Literature at Hue University. From 1964-1970 His Imperial Highness attended Dalat University where he earned masters degrees in Political Science and Business Administration. He then worked as assistant to Colonel Nguyen Be at the Ministry of Rural Revolutionary Development, Chi Linh - Vung Tau Center. From 1971-1973 His Highness was General Director of the 4th Tactic Zone at the Ministry of Economy in Saigon and until 1975 was Assistant General Director of the Vissan Company in the Ministry of Industry, Saigon. After 1975 Prince Buu Chanh was, like many others, forced into exile and moved to the United States. From 1982-1984 he attended North-eastern University Illinois where he graduated with high honors with a B.S. in Information Science. 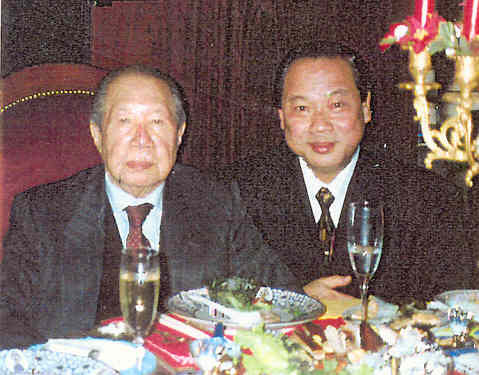 On the 18th March 1994, His Imperial Highness Prince Regent Nguyen Phuc Buu Chanh was recognized by the Republican Party, "for distinction and achievement in helping to promote and perpetuate the ideals and principles of the Republican Party" beside American Presidents Nixon, Ford, Reagan, and Bush Sr. and was recognized as a prominent leader. On the 16th June 1995, US Senate Majority Leader Bob Dole and Senator Alphonse M D'Amato bestowed upon the Prince a personalized "Eternal Flame of Freedom" Medallion and as well, His Imperial Highness Prince Buu Chanh was nominated to have his name engraved on the Ronald Wilson Reagan Eternal Flame of Freedom monument in Washington DC in the United States of America.